Table tents are not limited to the food industry. These unobtrusive, yet eye-catching displays can be placed on countertops, tables, and clothing racks or next to the register to promote specials. They can advertise target sale items, or increase point-of-purchase sales. If you are looking to get table tents designed, you might want to consider adding visual interest by using cut outs and irregular shapes. These effects can be easily produced when you utilize a laser paper cutting service. 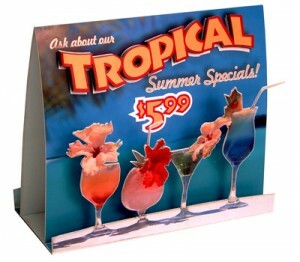 A beautiful example of this is seen below with this table top display that promotes summer drink specials.